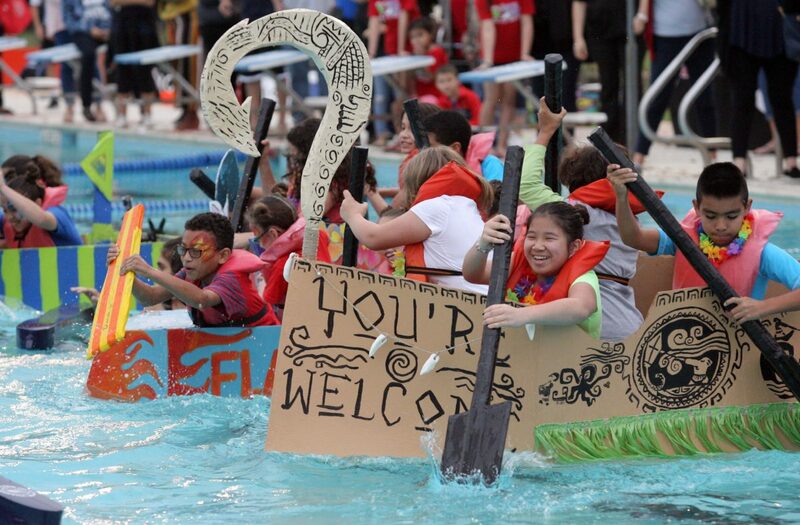 Truman Elementary School boat crewmembers Katie Nguyen, 11; Javier Salinas, 10; Layla Hogan, 11; and Lerona Knight, 10, paddle their way to victory during the Cardboard Boat Regatta sponsored by Edinburg Parks and Recreation at the Edinburg Waterpark on Friday March, 9, 2018, in Edinburg. 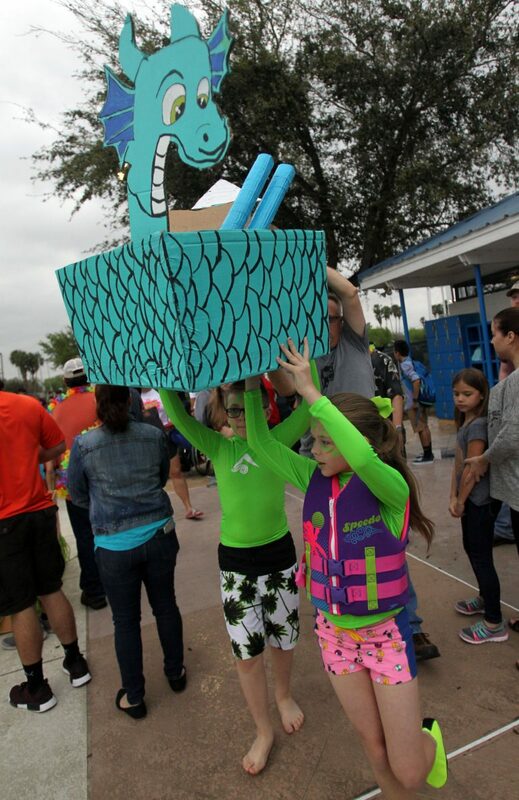 EDINBURG — Overcast skies and scattered showers didn’t stop the 30 or so participants Friday from taking part in the 4th Annual Cardboard Boat Regatta at the Edinburg Municipal Waterpark. The hour-and-a-half-long event brought the community out for an evening of entertainment and excitement as the teams put their floating creations in the water for the race across the pool. The competition was divided into three age groups: children 6 to 12 years old, teens 13 to 17 years and adults 18 years and over, and included schools and other local entities such as the Edinburg Police Department, Edinburg Fire Department, and Boys & Girls Club. One of the schools participating was Truman Elementary School with their cardboard boat which themed after the movie “Moana” with Maui décor. 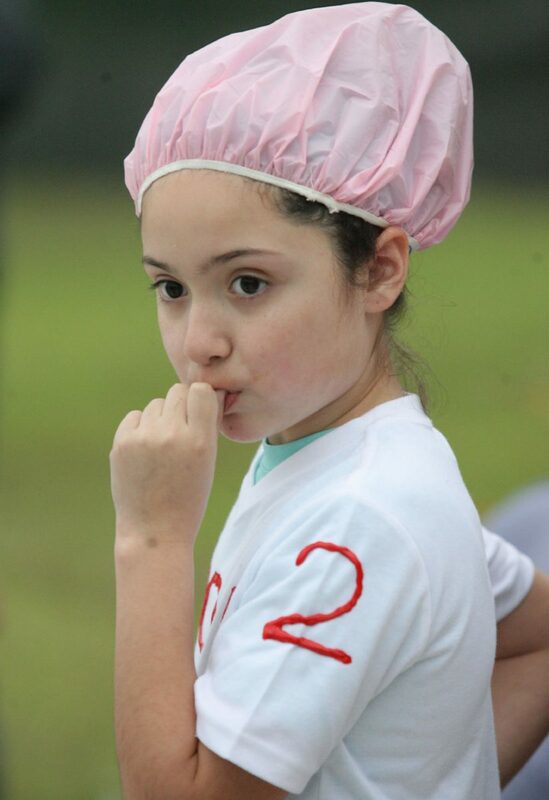 Canterbury Elementary Team USA boat crewmember Kiara Olivares, 9, gets ready to compete during the Cardboard Boat Regatta sponsored by Edinburg Parks and Recreation at the Edinburg Waterpark on Friday March, 9, 2018, in Edinburg. Canterbury Elementary Team Aqua Dragons boat crewmembers Lennon Moats, 9, and Connor Krska, 10, carry their boat to the water as they prepare to compete in the Cardboard Boat Regatta sponsored by Edinburg Parks and Recreation at Edinburg Waterpark on Friday March, 9, 2018, in Edinburg. 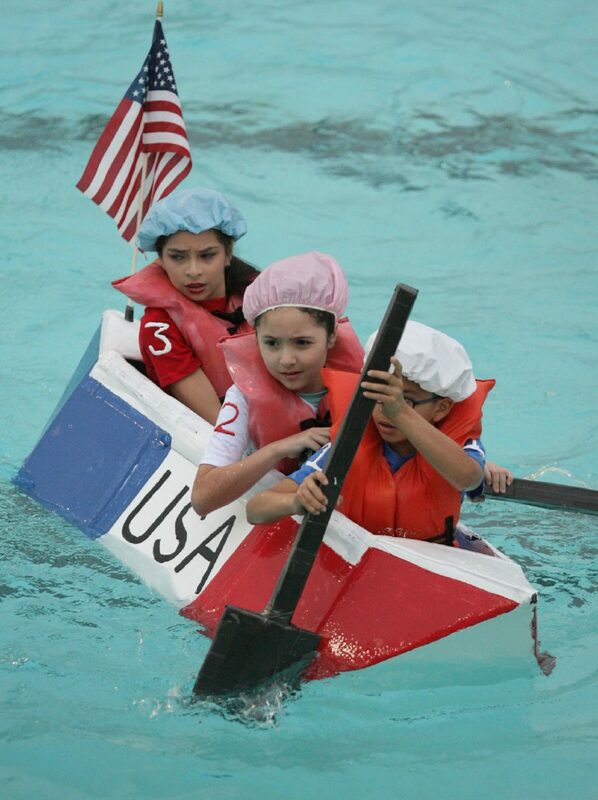 Canterbury Elementary Team USA boat crewmembers Aaron Ponce, 8; Kiara Olivares, 9; and Ava Ponce, 11, compete in the Cardboard Boat Regatta sponsored by Edinburg Parks and Recreation at Edinburg Waterpark on Friday March, 9, 2018, in Edinburg. 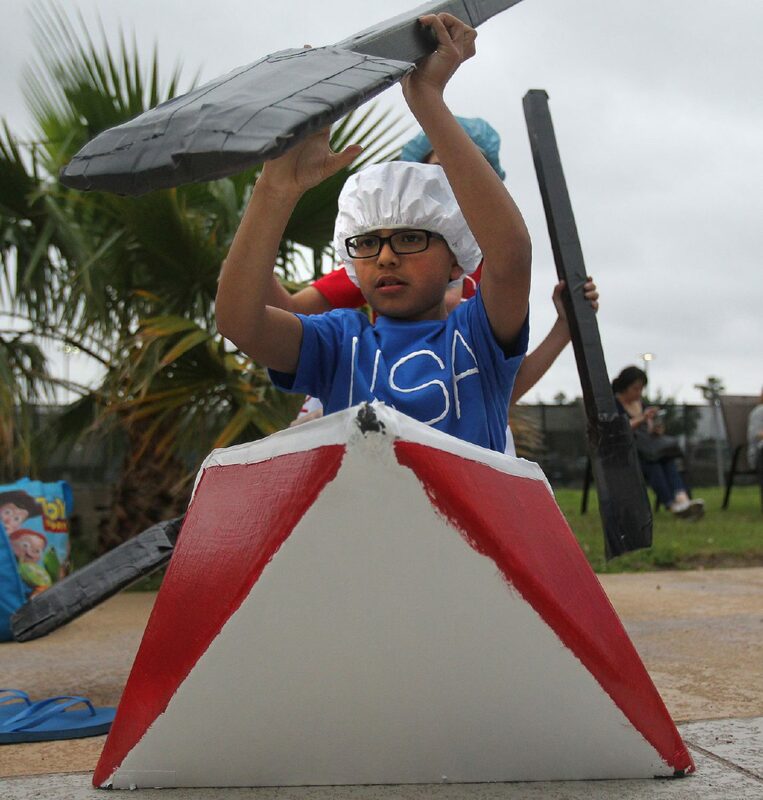 Canterbury Elementary Team USA boat crewmember Aaron Ponce, 8, gets ready to compete during the Cardboard Boat Regatta sponsored by Edinburg Parks and Recreation at Edinburg Waterpark on Friday March, 9, 2018, in Edinburg. Sponsor Barbara Gonzalez, music teacher at Truman, was the individual behind the idea. Gonzalez said she made some suggestions, but that the students came up with the design. “The kids were really, really creative and excited because we had already been singing about it,” she added. Students from the elementary school said the process of making the cardboard boat took about two weeks. Two months before the event, schools were notified about the competition so they could begin the planning process. The only requirement is that the homemade boat must be formed with cardboard boxes with tape as an adhesive including the oars. Additionally, only two to four members were allowed on the boat during the race. Mayor Richard Molina praised the creative efforts of the teams. At the end of the event, trophies were given out to the first, second and third place winners from each age category, as well as, trophies for special categories such as the best-dressed team, Speed Boat Award (fastest boat), Sea Horse Award (slowest boat), Titanic Award and Spirit Award.